Congratulations My Intention on Becoming a Million Dollar Sire! 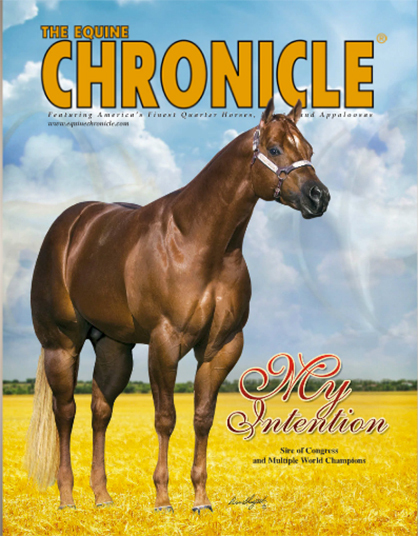 My Intention on the cover of The Equine Chronicle. We would like to send a big congratulations to Jim and Georgia Snow following the news that their stallion, My Intention, has recently become a Million Dollar Sire! According to Robin Glenn Pedigrees, foals by My Intention have won a total of $1,030,343 to date. In addition to being a sire of multiple Congress and World Champions, My Intention is an AQHA and APHA Leading Sire. My Intention is by Playgirls Conclusion and out of RPL My Te Touching. The public will soon have the opportunity to purchase a My Intention-bred prospect during Snow Quarter Horses Production and Broodmare Reduction Sale on June 25th in Quinlan, TX. Also included in the sale will be a son of My Intention, Exact, a 2012 APHA sorrel overo stallion who is a two-time APHA World Champion and National Halter Show Champion. Click here for more information about the upcoming sale. Congratulations Million Dollar Sire My Intention!